A popular finishing touch to any quality kitchen! This solid hardwood breadboard has an Alder body with Alder finger pulls at both ends. Permanently laminated to assure years of use and are sealed to resist moisture penetration with a safe FDA approved coating. 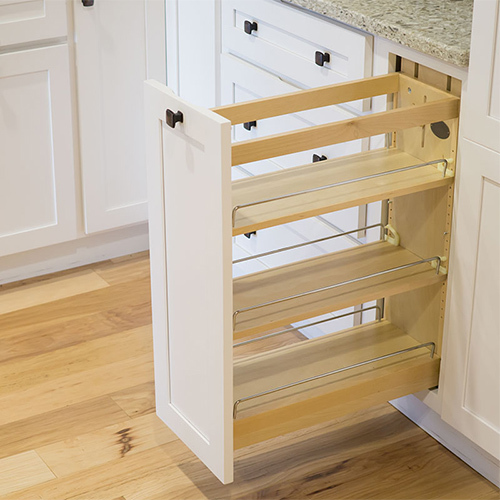 Designed for full-height base cabinets, these beautiful base organizers feature adjustable shelves with chrome rails to help keep everything in its place. Made from maple with a UV clear coat finish to match any kitchen décor. Units glide on our patented “tri-slides” which minimize any side-to-side motion and provide complete stability when pulled out of the cabinet.